David Adagblenya, Edify’s Christian transformation Officer in Ghana is involved in working to improve the lives of children through Christian education. 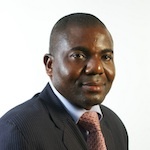 Prior to joining Edify, David worked for Sinapi Aba Savings & Loans (SASL) a leading Micro-Finance Institution in Ghana for 13 years rising through the ranks to become the Training & Development Manager. As an additional responsibility, David was in charge of the Kiva Project a fund raising platform based in the U.S.A. He was also in charge of SASL transformation from an NGO to a Regulated Financial Institution. David holds an Undergraduate degree in Agriculture Economics University for Development Studies, a graduate degree in Finance (MBA) from The University of Science and Technology and a graduate degree in Human Resource Development from the University of Cape Coast all in Ghana. David’s passion for the poor began when he joined Sinapi Aba as a credit officer and realized its impact on the lives of the poor and over the years was involved in various impact assessment researches and product designs for Sinapi Aba. David’s favorite part about his current job in Ghana is meeting with proprietors to discuss best practices in Christian Transformation and the potential impact of Edify’s Christian program on their schools. David is happily married to his wife Edna and they are blessed with two girls. They live in Kumasi, Ghana and enjoy travelling, reading and playing musical instruments.